All the Money in the World has been in the news a lot lately. It has garnered great reviews for director Ridley Scott. But a lot of attention has also been placed on the fact that the director made the last minute decision to replace one of his actors after the drama was completed, and still managed to turn it in on time. Ryan J. Downey recently met up with Ridley to discuss the tumultuous aspects of taking on such a task. He is also joined by actors Charles Plummer, Christopher Plummer and Michelle Williams. 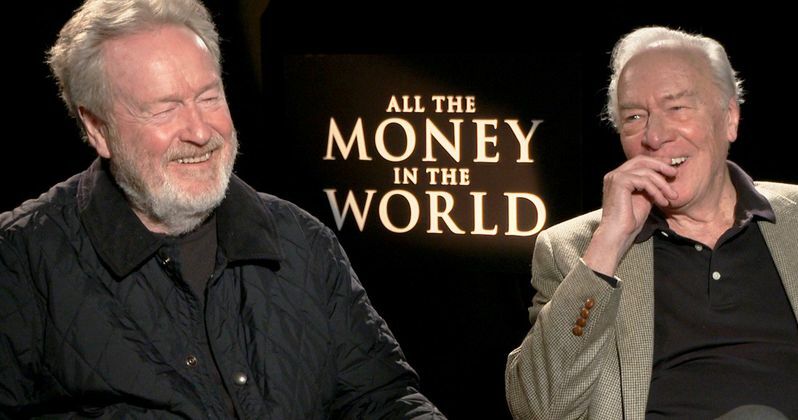 These exclusive video interviews span the entire filmmaking process, going inside the making of All the Money in the World for a fresh look at what has become one of this year's biggest Oscar contenders. The actors offer their own take on what it was like to be on set, and how Ridley Scott is still the master at making intense drama that shows a side of human nature rarely put on display at the modern cinema. All the Money follows the kidnapping of 16-year-old John Paul Getty III (Charlie Plummer) and the desperate attempt by his devoted mother Gail (Michelle Williams) to convince his billionaire grandfather (Christopher Plummer) to pay the ransom. When Getty Sr. refuses, Gail attempts to sway him as her son's captors become increasingly volatile and brutal. With her son's life in the balance, Gail and Getty's advisor (Mark Wahlberg) become unlikely allies in the race against time that ultimately reveals the true and lasting value of love over money. All the Money in the World was positioned as one of this Christmas' big holiday releases, and was the only movie to open on Christmas Day. As the release date loomed near, one of its stars found himself in a lot of trouble. Kevin Spacey, who originally played John Paul Getty Sr., was accused of sexual misconduct by serval men. When the news first broke, Ridley Scott didn't hesitate, and knew his movie would be dead in the water if he didn't move fast. The acclaimed filmmaker made an almost immediate decision that he needed to take Spacey out of the picture, and reshoot all of those scenes. And he did just that, calling in a major favor from Christopher Plummer, who shot for 9 straight days over Thanksgiving break. Downey covers this intense, and fast paced shoot with both Plummer and Williams, the later of which agreed to do the reshoots free of charge. In a previous interview, Scott, who goes on about the making and remaking of the film, had this to say about bringing it all together. All the Money in the World is one of the more interesting movies to come along in quite awhile. While the drama on screen is quite captivating, the drama behind the scenes is equally page turning. Go on that journey with Ryan J. Downey now in these exclusive interviews with the cast and crew, and learn what it was like to bring this Oscar contender to life, to the brink of death, and then back to a cinema near your in time for awards seasons, all without breaking a noticeable sweat.